My two new accessories today are my "I voted" sticker and my sample ballot. So chic! I vote every year and the best part of voting (aside from obvious answers such as expressing your voice and determining the fate of the state/country) are the cookies provided at the polling location in my area. These are some of the best chocolate cookies I have ever had and every year I salivate like one of Pavlov's dogs when I pull into the polling place. Unfortunately, this year, the cookies ran out! A very inauspicious sign if you ask me. Well, I cast my vote and returned with an empty stomach from the polls, but at least I fulfilled my duty as an American citizen. 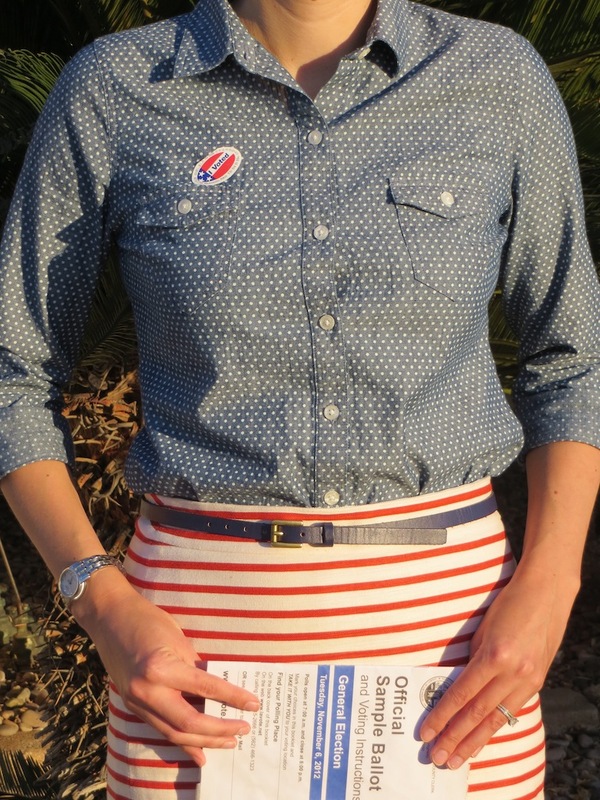 In honor of Election Day I wore red, white and blue. My patriotism went largely unnoticed, with the exception of someone who asked me if I had purposely dressed like a flag. The skirt I am wearing is the J. Crew Deck Stripe No. 2 pencil and the Old Navy polka dot chambray shirt. Perfect attire for voting in my opinion. I hope perhaps you will enjoy my patriotism and enthusiasm to get out there and vote! 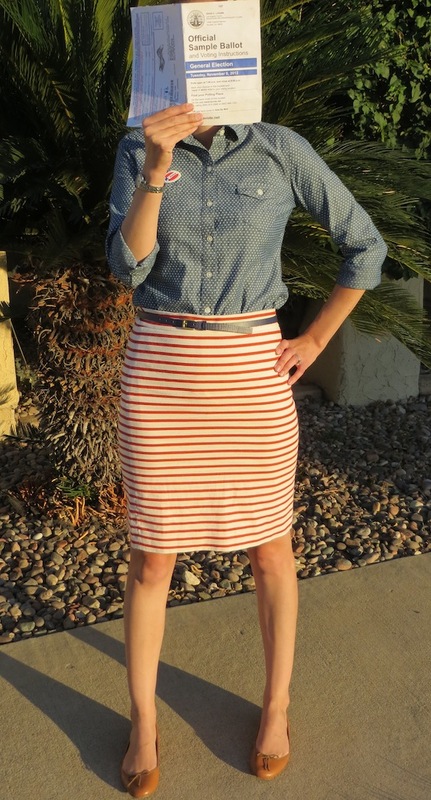 Totally digging this outfit - wish i had gotten that skirt! Sorry you missed out on the skirt. I have noticed that old summer stuff pops up on the website every once in a while. fun look!!! i love this on you! Thanks phi phi! I try to be fun and dress up in celebration of various "holidays." Not that election day is really a holiday, but you know what I mean!